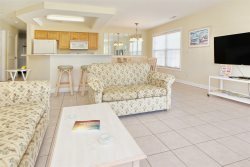 Large two bedroom furnished golf villa at Sea Trail. All buildings have elevators. Location in close proximity to Sunset Beach Bridge for your vacation pleasure. Sea Trail has three golf courses. This Champions unit has its own community outdoor pool. Three large beds, 1 King in main unit, 2 Queen size beds in large lockout, WiFi, linens included. Guests can pay a minimal fee for use of the main amenity center. Close to Sunset Beach an Myrtle Beach. Condo also includes Full size washer and dryer. All bedroom and bathroom linens are included and in the condo for you when you arrive. Also the Kitchen is fully stocked with all of the appropriate cooking utensils, dishes and cutlery.
. Condo also includes Full size washer and dryer. All bedroom and bathroom linens are included and in the condo for you when you arrive. Also the Kitchen is fully stocked with all of the appropriate cooking utensils, dishes and cutlery.